Zhang Yimou, China’s best filmmaker (“Raise the Red Lantern,” “Ju Dou”), is so cocksure he has come up with such a hip idea that he doesn’t realize how he has negated it to cheese. 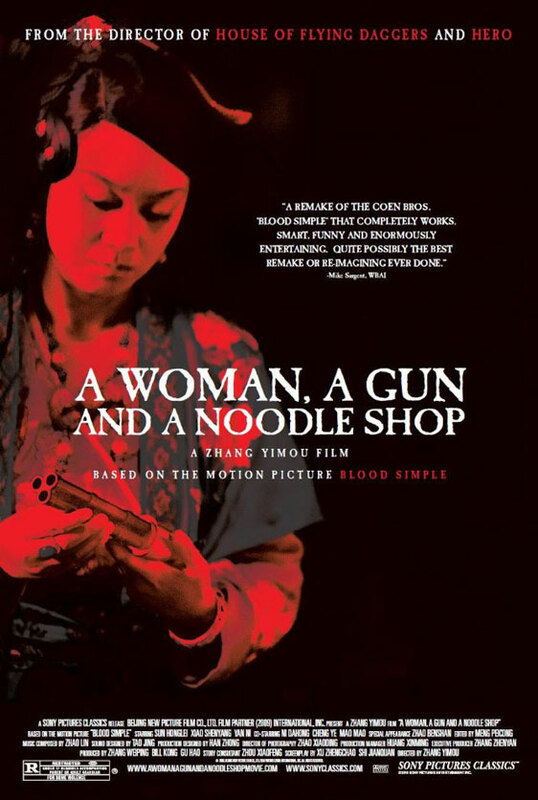 A Woman, a Gun and a Noodle Shop (Mandarin, in English subtitles) takes the Coen Brother’s classic “Blood Simple,” their 1985 debut that played like a Southwest honky tonk noir, and spits it out into a Chinese western where they use guns and bows and arrows. 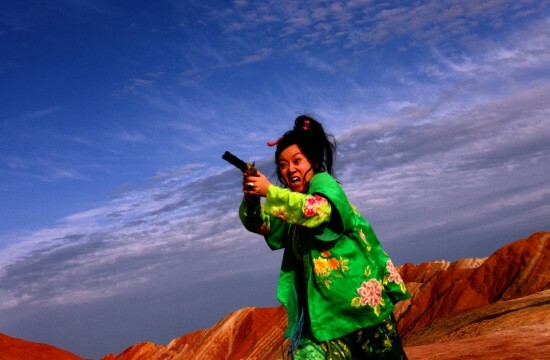 Yimou puts together a really annoying gallery of quirky and loud characters all dressed in gaudy kimono silk, and one badass crooked lawman who doesn’t say much at all. 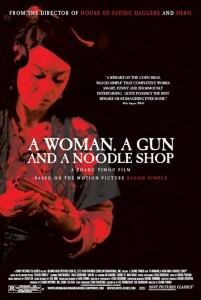 You have to really have a neverending fever for Chinese exoticism to get wrapped up by this flick. Just like the Coen’s tale, the suspense concoction involves a missing loot, dead bodies that need hidden, a bury-a-person-alive scene and other assorted methods to cover tracks. The witless beauty (Yan Ni, nice slutty lips) is two-timing her husband (Ni Dahong) with a klutzy coward (Xiao Shenyang) who works at their noodle shop. The police roam the desert lands, but that doesn’t stop the cuckold husband from hatching a plan to knock off his wife. The story takes place in a desert land in a time long ago (no surveillance, no witnesses should make this easier than it is as long as hubby has an alibi). One remorseless cop (Sun Hunglei, he must think he is starring in “Westworld”) is hired to do the killing, but he wants more money, so his greed triggers a series of events that result in tireless bloodshed. Not only are the poorly named and poorly defined characters less interesting than they were in the Coen’s work, but the plot is harder to follow in the scrabble-mad approach that Yimou has come up with. For some reason, Yimou found it important to put in some very loud horse galloping, and the sounds effects of foot running are also needlessly hyperactive. The best one can do to get through this is to fake half-hearted amusement until it’s over. If you are looking for Yimou’s crucial miscalculation, in the worst film that he has ever made, it’s this: When you set a film in a time and place that is not remotely real nor magical then nothing that happens in the story is going to matter. What we see is caricatures set against a cardboard abstraction of a time period. Film Cousins: “Westworld” (1973); “The Postman Always Rings Twice” (1980); “Blood Simple” (1985); “Shanghai Triad” (1995, China).